Brewer, a Republican seeking re-election, said the measure "represents another tool for our state to use as we work to solve a crisis we did not create and the federal government has refused to fix." Arizona has taken a draconian — but quite possibly constitutional — step to try to control the explosive flow of illegal, mostly Mexican, immigrants across its borders. The new law signed by Gov. 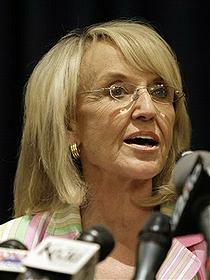 Jan Brewer last Friday puts the burden of proof of legal residency on anyone police in the state have probable cause to believe may be there illegally. Round up the usual liberal bleeding hearts: They’ve been screaming like stuck hogs ever since, about racial profiling, violations of human rights, legal immigrants afraid to go out on the street — all the usual horror stories conjured up by the Left. Of course, Arizona’s legislature and governor wouldn’t have felt forced to take such a drastic step if the federal government, Republicans and Democrats alike, had been doing its job in protecting our borders for quite a few years now. Our southern border leaks like a sieve — we all know that, there’s no serious question about it, and the feds who are responsible for border security have been willfully asleep at the switch for a long time. Why is this? You could hold a “great debate” about that, but in my opinion, it all boils down to two things: The Republicans don’t want to stop illegal immigration because their constituents among business employers want cheap labor; the Democrats don’t want to stop it because they see every illegal Mexican as a potential and likely Democratic voter. Arizona’s government didn’t take this step in a vacuum. The state is being inundated by these border jumpers. They’ve added immeasurably to medical costs, rising crime rates, and the like. Murderous drug cartel feuds among Mexicans are starting to spill over into Arizona. The illegals do, indeed, take some jobs away from deserving Americans. People like to say, “They do the jobs Americans won’t do.” No; they do the jobs for less money than Americans would if they were the ones who were being hired for the jobs. Yes, many things would cost more if Americans and not Third World Mexicans were picking them, or making them, or hauling them. So it’s a question of what you want: Jobs for Americans and a dollar a pound more for tomatoes; or cheaper goods, and a gradual takeover of the Southwest by Hispanics, mostly Mexicans. Many people will insist that that statement is both extreme and “racist.” They’ll say that the new Arizona immigration control law will allow police — presumably White and “racist” — to stop anyone they feel like who appears to be Hispanic and “hassle” them with demands for ID. From what I’ve read and heard about the new law, it does not give police a “carte blanche” to do anything that extreme. But here’s the thing: In Mexican schools, children are routinely and systematically taught that the United States “stole” the Southwest from Mexico, and that it should be the goal of Mexicans entering the United States to some day constitute such nunbers in states like Arizona, Texas, New Mexico and the like, that they can vote for those states to secede, and be “re-united” with Mexico. That has a powerful, emotional pull on most Mexicans. Their government is doing little to prevent the flood of immigrants that cross the Rio Grande. After all, export them to the U.S., and Mexico is no longer responsible for them. Mexico has a rapidly growing population of 110 million; it can well afford to lose several million of its poorest citizens. But Mexico has a higher standard of living than its neighbors just to the south, the Central American countries — with the possible exception of Costa Rica, which has long had a democratic government. So are people from Guatemala, and El Salvador, and Honduras, and Nicaragua, welcomed with open arms when they try to improve their lives by crossing into Mexico across its southern border? Not on your tintype, they’re not. They’re met by the Mexican army, which routinely beats, robs and jails them. When it comes to the people who run Mexico, what’s sauce for the goose is most definitely NOT sauce for the gander. You see? Other countries, besides the U.S., feel no moral obligation to allow immigrants in in significant numbers. They feel no guilt for not welcoming them. Japan has kept its population 99 percent ethnic Japanese by being very stringent about immigration. China, which is a several-thousand-year-old civilization, once built its Great Wall to keep out the “barbarians,” as the Chinese viewed them, from the north. Today, China’s population is 91.9 percent Han Chinese. Only in America, Europe, and places like Australia and New Zealand, places once very largely Caucasian, have the bleeding hearts managed to berate and shame the governments into letting in millions of people who will not blend into the existing country, but will change it irrevocably. But those people were Europeans, who could gradually blend into a country still 89 percent White in 1960. And because they had to come across a wide ocean, it was much easier for our government to control the flow of them; to let more in in some years, less other years. The Hispanic invasion of modern times is not like that. The federal government appears to have given up at trying to put any kind of controls on it. President Obama is belatedly talking about “immigration reform.” What does that mean? What is “reform”? Declaring all the illegals in the country, legal, at the stroke of a pen? 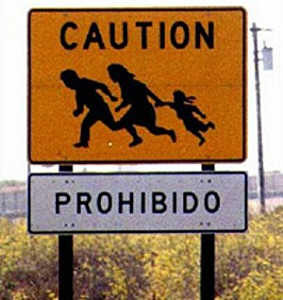 Chasing down every American contractor and tobacco farmer who employs illegals and pays them in cash, and fining them? How many more federal bureaucrats will that necessitate? We’ve treated the illegal immigration problem with “benign neglect” — at least the federal government has — until, all of a sudden, hey! it’s not a “problem” any more! It’s a crisis! Arizona is one of the states at the forefront of the crisis. Its government got tired of waiting for the feds, Democrats and Republicans alike, to stop squabbling and so something. So Arizona did something itself. Maybe it’s just the start of a trend. Remember when that guy said, a little over a year ago, “What we need is a new Tea Party!”? If Obama required every citizen to carry a passport or other national ID at all times, including children, you’d be fleeing for another country. Wake up. Giving the government this kind of power is bad news. OK, JaneAZ. If you think illegal immigrants shouldn’t have to show proof of status, then how would you deal with the problem? Or do you not even think there is a problem? I’m interested to know. Um, sorry to point out the authority is already there at the federal level and has been for many years. Unfortunately the federal government, our federal government does not do it’s job very well, in fact it does it very poorly. The bill SB1070 is framed within and under the federal immigration laws already in force (but poorly practiced). Anything they do in Arizona under this new law points directly to the Feds and any person that is found in violation of the United States immigration or residency status is immediately handed over to them. (The Feds). Currently the law, even though it’s officially enacted and now law, will not go into effect until 90 days have passed. Then it’s on baby! Arizona is already prepared for the court tests the various Hispanic Leagues and the ACLU will undoubtedly file. In researching past Arizona immigration ‘tweaks’ at the state level out of the 9 that were challenged by such groups, all were upheld as legal. A couple went all the way to the supreme courts. Again, Arizona has done it’s homework and knows the true cost of illegal immigration; this will save them the costs associated with many things and the legal costs certainly will pale in comparison. Like OC says, it’s not as if the authorities can just question you at random or because of your skin color. There has to be a primary offense first before they can check you out and that’s only if there is something else that doesn’t add up. Every US citizen has a social security number, it only takes a moment to check it. And for all practical purposes we should at least have the very same stringent immigration rules and enforcement as our neighbors to the North and South. I expect several other states to follow Arizona’s lead. About time. One other note of interest (or not), the new law uses the Feds own US code, that ‘requires’ the Feds to act and respond to any lower US government entity or law enforcement entity in regards to immigration status of ANY person on US soil. That part of the US code has been in force for years but you don’t hear an uproar from the liberal bleeding hearts about that now do you? The law also specifies some very severe monetary penalties for employers of illegals, that know they are illegal. It only takes a few moments to utilize E-verify; compliments of taxpayers like you and me. Arizona can pass race base laws, pass Birthers laws and the state can continue to boycott Martin Luther King Day, well the rest of the Country can boycott the state of Arizona and spank them where it hurts them the most their pocket book. Their phony patriotism is sickening, they are just racists going by another name. We all know you are just itching to put a sheet on their head? Let’s face it the Republicans had eight years to deal with health care, immigration, climate change and financial oversight and governance and they failed. It appears that the Republican Party is only good at starting wars (two in eight years, with fat War profiteering contracts to friends of Cheney/Bush) but not at winning wars as seen by the continuing line of body bags that keep coming home. The Republicans party will continue turned inward to their old fashion obstructionist party (and their Confederacy appreciation roots) because they continue to allow a small portions (but very loud portion) of their party of “birthers, baggers and blowhards” to rule their party. I will admit that this fringe is very good at playing “Follow the Leader” by listening to their dullard leaders, Beck, Hedgecock, Hannity, O’Reilly, Rush, Savage, Sarah Bailin, Orly Taitz, Victoria Jackson, Michele Bachmann and the rest of the Blowhards and acting as ill programmed robots (they have already acted against doctors that perform abortions). The Birthers and the Tea party crowd think they can scare, intimidate and force others to go along with them by comments like “This time we came unarmed”, let me tell you something not all ex-military join the fringe militia crazies who don’t pay taxes and run around with face paint in the parks playing commando, the majority are mature and understand that the world is more complicated and grey than the black and white that these simpleton make it out to be and that my friend is the point. The world is complicated and people like Hamilton, Lincoln, and Roosevelt believed that we should use government a little to increase social mobility, now it’s about dancing around the claim of government is the problem. The sainted Reagan passed the biggest tax increase in American history and as a result federal employment increased, but facts are lost when mired in mysticism and superstition. For a party that gave us Abraham Lincoln, it is tragic that the ranks are filled with too many empty suits and the crazy Birthers who have not learned that the way our courts work is that you get a competent lawyer, verifiable facts and present them to a judge, if the facts are real and not half baked internet lies, then, and only then, do you proceed to trial. The Birthers seem to be having a problem with their so called “facts”. Let’s face it no one will take the Birthers seriously until they win a case, but until then, you will continue to appear dumb, crazy or racist, or maybe all three. I heard that Orly Taitz now wants to investigate the “Republican 2009 Summer of Love” list: Assemblyman, Michael D. Duvall (CA), Senator John Ensign (NV), Senator Paul Stanley (TN), Governor Mark Stanford (SC), Board of Ed Chair, and Kristin Maguire AKA Bridget Keeney (SC), she wants to re-establish a family values party, that’s like saying that the Catholic Church cares about the welling being of children in their care, too late for that. So all you can do is plagiarize someone else writing and post it as your own? Do you have any thoughts on immigration that are your own? Or is it your own and you are spewing this irrelevant rhetoric as far and wide as you can? That would be sad too. Just whom did I “plagiarize,” Arizona? I take it you’ve read every word every written about the situation in the state of Arizona, and remember it all word for word. Because, otherwise, how could you logically accuse me of plagiarism? I’m outlining what happened and is ongoing in Arizona, and giving my views on it. If you call that “plagiarism,” maybe you should check your dictionary again. Hey Wayne, me thinks they were talking to the Montana ranter… I googled it and his text comes back at some other sites verbatim. Wow! Montana, you sound like you’re right at stroke level! I’d hate to be the cause of your having a sudden illness. Have you tried Zoloft? Arizona, I apologize if I falsely assumed you were the one accusing ME of plagiarism. Apparently it was you directing the accusation at Montana. Sorry about the mistake. Thanks, Foobar, for the heads-up. Keep these atircels coming as they’ve opened many new doors for me. Just build a fence and add some electrical current. Problem solved. Good thinking, Yikes. Wish I’d have thought of that, so I could have added it to my column. Of course, then the Leftists reading this website would call me a “racist.” But, hey, that’s happened so many times now I don’t even look up — just keep on trucking. It would just get tapped and used for cooking and to power entertainment devices. Instead of giving away free power we have to turn inward and go after the AMERICANS who are enabling this massive influx in the first place. YES, I will pay more for lettuce IF it means no more illegals and more working Americans. I like the fence for obvious reasons, but it will be useless if we can’t stop the reasons they are able to get a toe hold in the first place. We may need to apply a top-down approach and put some wealthy a-holes in prison. Maybe they’ll cozy up to some of their former workers there. This is another great example of the often misplaced race card. The very idea that Arizona cops are ready to don white hoods is in itself a racist position to take against cops just for being white! But honestly, are Arizona cops predominately white? Do the Hispanic cops in Arizona get to wear the white hoods too? Americans are SICK of the race card being used on them at every turn and are beginning to realize that racists are the very ones using it. But for too long the leftists and social “engineers” have been unable to bring about their vision of equality without slinging mud at white people. It deflects attention from the REAL problems in minority communities that white people did NOT cause. The fact that Arizona modeled this law after existing federal statutes was a double blow. Any legal case brought to their door is just as valid at the Whitehouse door. So by all means, bring it on. Wow, that’s a really clever way of tinhikng about it! Arizona’s first step needs to be copied by the other lower 47 states. Time to seal the border. End the crime of illegal immigration and deport these parasites hanging onto our wallets and economy. If illegal immigration were as benign and wonderful as liberals would have us believe, there would be no need for Arizona or any other state, much less town or city to take direct legislative action against illegal immigration! But due to the verifiable reality of many CRIMES committed by illegal immigrants, once they reach our country, action must be taken. Effective and definitive action! Liberal and church-disseminated propaganda not withstanding, citizens any state along the Southern Border can and generally would verify that crime, by illegals is not only common, but nearly epidemic! Phoenix, Arizona’s problem is so bad, we learned from a friend, he goes out ARMED if he and his wife expect to return home in the dark. After suffering several burglaries and car break-ins, they had to invest in a costly burglar alarm system. The wife seriously considering quitting her job, given her car was almost stolen twice while she was at work. Here in Texas, San Antonio and Houston — crime havens for illegal aliens. Given the “sanctuary city” status forced on our residents.